On Friday June 21st, WagonWheel Presents… is delighted to welcome the The Lonesome & Penniless Cowboys back to Sheffield, in their own words “probably the best band you’ve never seen”. Those of you lucky enough to have seen them before know we’re in for a night of the finest old time Country, Cajun and Western Swing at The Geystones. 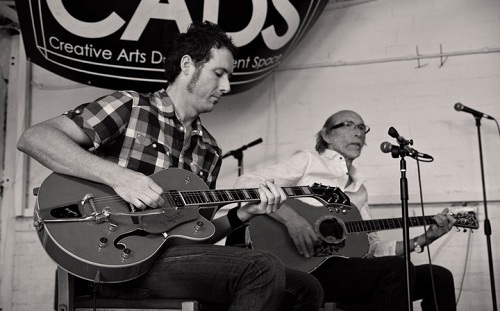 As if that wasn’t enough, we also have Sheffield’s own rock ‘n’ rollin’ father & son duo M&J Blues to kick things off with a bang. A fantastic night out guaranteed. Advance tickets priced at £5 are available from http://www.wegottickets.com/event/209254 or over the bar in the venue (12-6pm). Entry on the night will be £6. Doors open 7.30pm for an 8pm start. 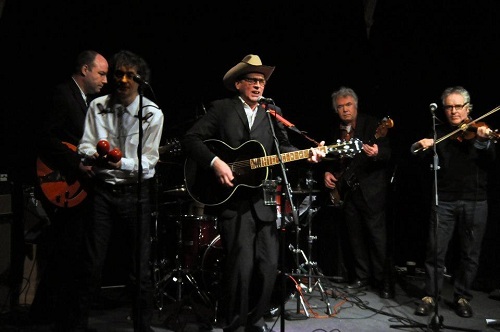 The Lonesome & Penniless Cowboys, probably the best band you’ve never seen are back . In the dark and dismal early 80’s, before you were born and when Britain was still in black and white, 3 men had a vision, a dream and indeed a calling. Somehow The Thin Man, Clive Mellor and Mog decided it was their life’s vocation to make people love country music. Before Alt Country, before New Country before Americana and before a million hipsters wore Johnny Cash T shirts The Lonesome & Penniless Cowboys were formed just to let people know the truth. Hank Williams, George Jones, Gram Parsons, The Louvins etc had a body of work that any one with a heart, a soul and a hard luck story would love. Turned out the plan worked and after turning Chorlton Irish Club into a regular venue and packing it out every week the cowboys’ reputation and alongside it the love of country music in the North West grew. The Cowboys more or less called it a day in the 90’s but realised that they enjoyed each other’s company and the joy that came ( to them and audiences) from bashing out their unique blend of Country, Cajun and Western Swing so occasional gigs were played, often more by accident than design. In the last decade the Cowboys have played an average of 4 gigs a year, but, as none of us are getting any younger and having narrowly missed the end of the world twice in recent times. They’ve decided to up the ante and play at least 6 gigs a year. That included a recent one month residency at The King’s Arms in Salford. Tonight they make a welcome return to Sheffield after two years away. M&J Blues are father and son Mark & Jeff Lyall. They’re regular performers at many Sheffield venues doing their bluesy country rock ‘n’ roll thing. The ever popular duo will kick the night off in fine style.